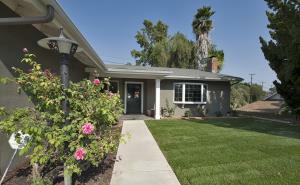 Lovely Diamond Bar home with extensive upgrades conveniently located close to Diamond Bar High School. This ranch style home features 4 bedrooms and 2 full baths across almost 1,900 square feet of living space. Generously upgraded throughout, newer touches include engineered wood floors, updated bathrooms featuring stone counter tops, tile floors, and tile shower enclosures. The remodeled kitchen offers a six burner Thermador range with oven, vented hood, granite counter tops, and a large center island with wine refrigerator. The large master suite includes a roomy walk-in closet and opens to the peaceful backyard. Detached 2 car garage with electric vehicle charging station. Sitting comfortably above street level, this well maintained, tastefully updated home sits in the award winning Walnut Unified School District. The perfect place to call home.